Doesn’t She Look Natural? by Angela Hunt is a contemporary Christian novel and the first in the Fairlawn series. The novel follows recently divorced Jen, her two boys Clay and Bugs and her mother Joella. Jen inherits Fairlawn, a funeral home in Florida, from her great uncle Ned. The four travel to look at their inheritance, planning to sell it and return to Virginia. The novel is mainly written in the first person from the point of view of Jen. It also has passages in the third person from the viewpoint of Joella. There are a great many themes in the novel including that of family. Jen’s family unit was ripped apart by her husband’s infidelity. Her mother is always there for her. And Jen is there for her boys. Both women aim for stability for the boys. Everything they do is motivated by love. Love is a major theme. God loves His children “even when they are outraged and hurt.” Nothing can separate us from God. We are called to show God’s love to the world, no matter what we are feeling. Love is an action. We are called to be His eyes and ears, His hands and feet, as we reach out to others. “These hands demonstrated God’s love for the lost and the lonely.” Nowhere is love shown more than at Fairlawn. Gerald, the mortician believes that everything he does must be done out of love for the sake of those left behind. Closely linked to love is the theme of support. In a close knit community there is always some level of support but when the chips are down, the community rallies together. They love together and they weep together. They offer support in all its forms. The power of prayer is seen within the novel. Bugs prays the simple prayers of a child. His grandmother realises that she needs to pray like Bugs instead of “worrying on my knees… I’ve been doing all the talking.” When we pray we need to give God space to speak to us. The novel shows how work can get in the way of family relationships. Being busy can mean that one misses out on family life. Jen used to have a powerful job but over the course of the summer (and the novel) her priorities change. You cannot ever get back time, so it is important to use it wisely. You do not want to miss the milestones as your children grow. Forgiveness is also another theme. It needs to be given out without any strings attached. Forgiveness is freeing for all concerned. Failure to forgive will keep one trapped in the past and build a barrier between us and Jesus. “For the last six months… a wall of hurt stands between me and Jesus.” The past needs to be faced and dealt with in order to be able to move forwards. I thoroughly enjoyed Doesn’t She Look Natural? and am planning on reading books two and three in the series. 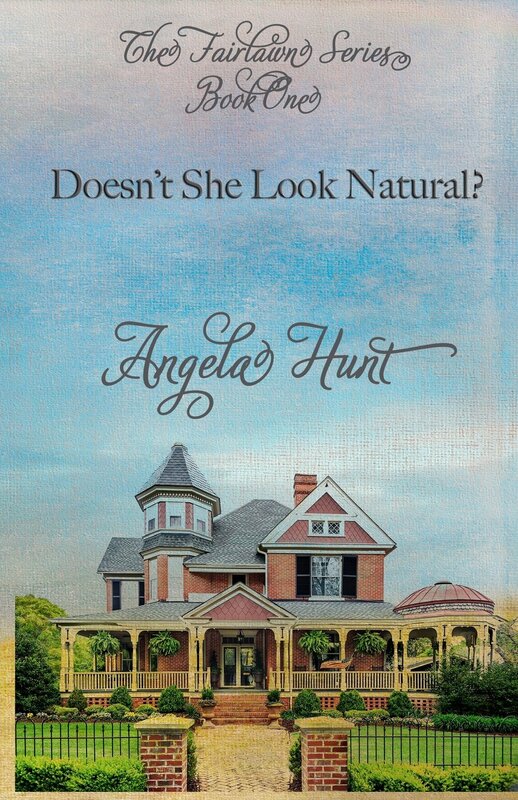 Angela Hunt is an excellent writer and I always enjoy her novels. I can highly recommend this one.